BGEN Martinez and Philippine Military Attaché Col. Pascua pay tribute to LTC Perez during the Act of Homage Ceremony. 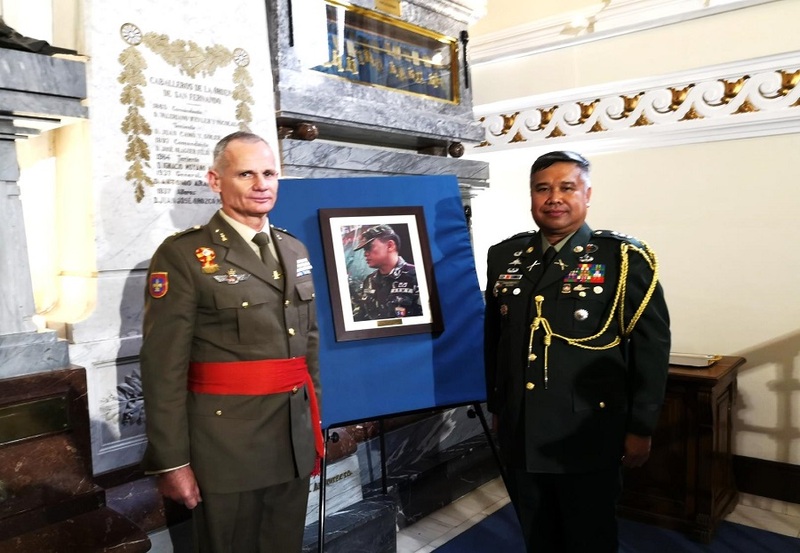 The Spanish Army´s War School paid tribute to the late Lieutenant Colonel Cristóbal Julián Paolo Pérez of the Philippine Army through an Act of Homage ceremony held in Madrid on 28 June 2018. BGEN José María Millán Martinez, Director of the War School of the Spanish Army was joined by Philippine Defense and Armed Forces Attaché Col. Harold Anthony F. Pascua, PA, during the Act of Homage in honor of LTC Perez of the Philippine Army who was killed in 2016 in a terrorist act in Mindanao, the Southern part of the Philippines. 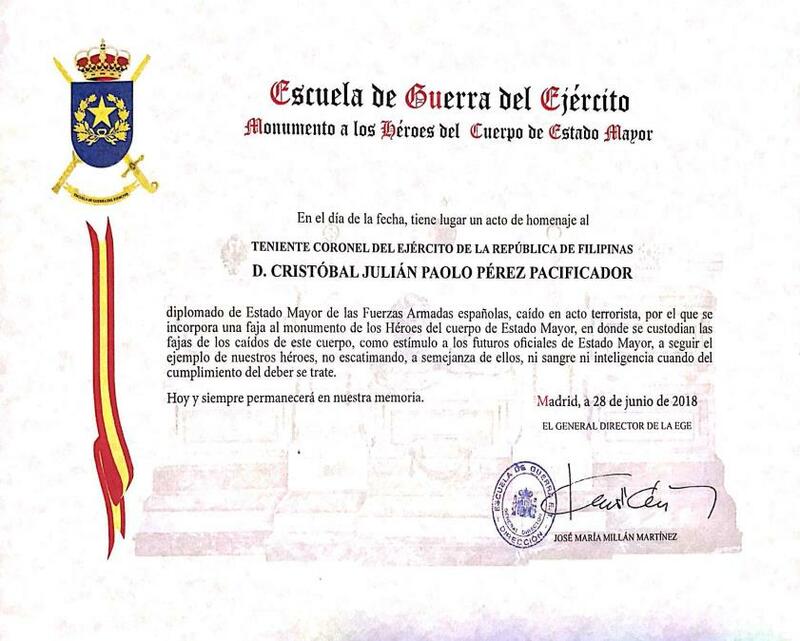 LTC Perez, an alumnus of Centro Superior de Estudios de la Defensa Nacional (CESEDEN) attended the said prestigious Spanish institution in 2012. The Spanish Army´s Act of Homage is a solemn ceremony in honor of those who sacrificed their lives, usually for Spain. 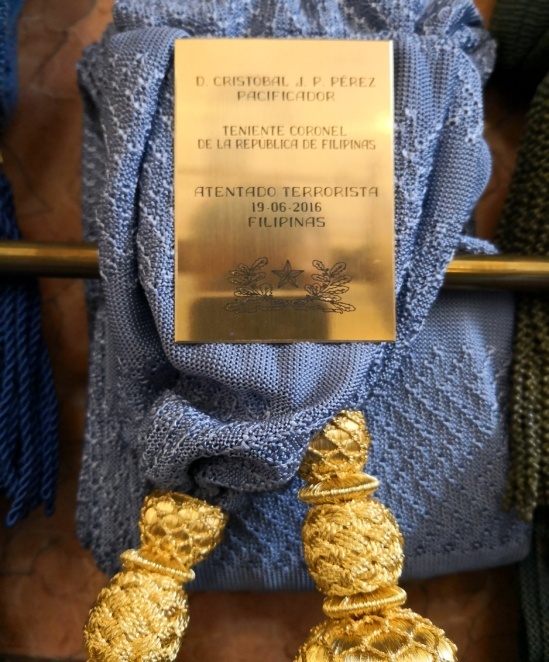 The ceremony featured LTC Perez’s blue sash with his name on an engraved plate and was incorporated in the monument of the heroes of the General Staff Corps, which is located within the Spanish Army´s War School in Madrid. The ceremony highlighted LTC Perez’s career and the Spanish Army presented a diploma with an inscription of LTC Perez’s heroism, which was followed by a wreath-laying on the monument of the heroes. The ceremony also featured the national anthems of the Philippines and Spain, taps and hymns for the fallen and the message of BGEN Martinez. The tribute to LTC Perez was also held as part of the celebration of the 16th anniversary of the Philippines-Spain Friendship Day.